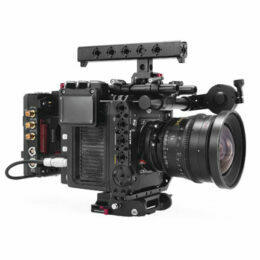 The R/S functionality needs to be transferred to the camera cage from the camera body through the Alexa Mini’s EXT port. The cable to do this is the 7-pin to 7-pin EXT cable, which is included in the Camera Cage for Alexa Mini. How many Amps of power does the cage provide? The 3-pin R/S ports on the cage aren’t triggering the camera. What’s wrong? Is there a way to extend the length of the top handle in order to operate the camera off the back of the setup? On my gold mount battery plate-fitted cage, when I touch the battery while the camera is powered on, the whole system shuts down. What’s wrong? The fan on my Alexa Mini battery plate is acting erratically. What is the issue? I lost the cage’s mounting screws. Can I buy replacements? I want to use an external source to power the camera. Can I use power supplies that are 24V?